TOKYO -- Secretary of State Mike Pompeo tried to cast negotiations with Kim Jong Un's government in a more positive light after North Korea accused him of making "gangster-like" demands in talks over the North's nuclear program during a two-day trip to Pyongyang. "If those requests were gangster-like, they are, the world is a gangster," Pompeo said. "There was a unanimous decision at the UN Security Council about what needs to be achieved." A spokesman for the North Korean Foreign Ministry said the talks with Pompeo had been "very concerning" and betrayed the spirit of the Singapore summit between President Trump and Kim in June. Pompeo said North Korean officials had recommitted to complete denuclearization. While he acknowledged that the road ahead will be "difficult," Pompeo stated that "peace is worth the effort." Despite the accusatory language from the North Koreans, Pompeo refused to label the talks a failure. "We had detailed and substantive discussions about the next steps towards a fully verified and complete denuclearization," Pompeo said. During a press conference with his Japanese and South Korean counterparts in Tokyo, Pompeo appeared open to a more step-by-step negotiating process with North Korea that would include additional security assurances for Kim's government, one of the regime's key demands. There will be "things that take place along the way" that give North Korea the security assurances they are seeking, Pompeo said. In drawing a clear distinction between sanctions and security assurances, he labeled economic sanctions "another kettle of fish" which will be enforced with "great vigor." "Sanctions will remain in place until final, fully verified denuclearization as agreed to by Chairman Kim Jong Un has occurred," Pompeo said. Pompeo traveled to Hanoi, Vietnam, after his visit in Tokyo and delivered a message directly to Kim. "This miracle can be yours," Pompeo said during brief remarks at a reception, referring to the socialist country's recent economic growth. 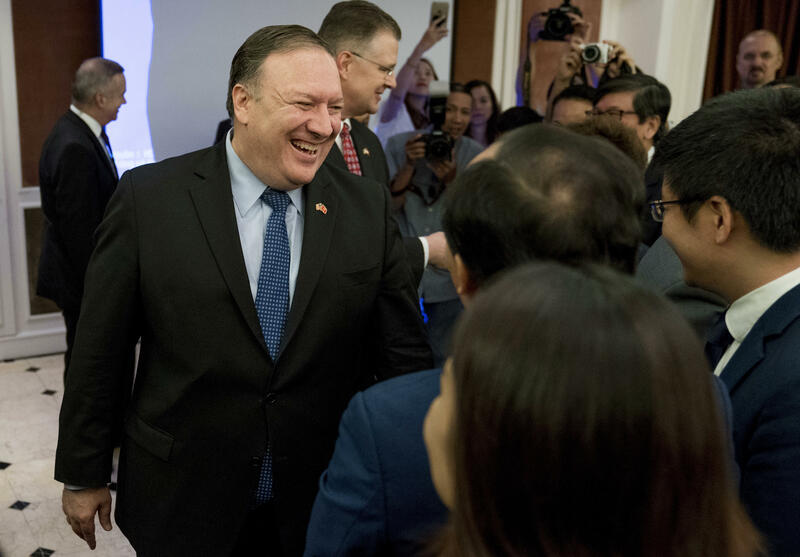 Pompeo referenced the history between the U.S. and Vietnam and drew direct parallels to a "brighter future" that North Korea could enjoy if the regime decides to "cooperate" with the U.S. He said Vietnam has traveled a "remarkable path," noting that the U.S. and Vietnam started working to repatriate the remains of lost service members in 1985. The U.S. and North Korea remain entangled in talks over the repatriation of the remains of about 200 missing American soldiers. Department of Defense officials will meet with North Korea to determine the details of the hand-over later this month. Earlier in the day Saturday, Pompeo tweeted that the "maximum pressure" campaign -- crippling sanctions on North Korea aimed at forcing then to the negotiating table -- will continue. The Trump administration has carried out this campaign since coming into office, but Mr. Trump vowed to no longer use the term "maximum pressure" in early June. State Department officials did not reply when asked if the renewed use of the term means that new sanctions are on the horizon. The U.S. has already agreed to suspend joint military exercises with South Korea. Despite Pompeo's indication that the U.S. may be willing to provide additional security assurances to North Korea, State Department spokesperson Heather Nauert explained that Pompeo did not soften any U.S. positions in the meetings. "The Secretary has been very firm in his conversations and has raised every element of the agreement from Singapore, complete denuclearization, security assurances, and the repatriation of American remains," Nauert said. Pompeo's strong-armed approach struck a nerve with the North Koreans, as evidenced by the foreign ministry's angry statement Saturday. "The U.S. side came up only with its unilateral and gangster-like demand for denuclearization just calling for CVID, declaration and verification, all of which run counter to the spirit of the Singapore summit meeting and talks," read the statement. The North Koreans said the meetings in Pyongyang were focused on the need to nurture "good relations" between the leadership of the two countries. They claimed that Pompeo and his team did not bring up peace on the Korean Peninsula more broadly, beyond using denuclearization to accomplish that goal. The U.S. "took the position that it would even backtrack on the issue it had agreed on to end the status of war under certain conditions and excuses," wrote the North Korean statement. They called the meeting "deeply regrettable." Some experts indicated that the language was not as aggressive as it could have been. The statement was not immediately made public inside of North Korea, and it was unclear if it would be. Pompeo said in Tokyo, however, that the Singapore summit agreement needs to be implemented on all fronts in a way that builds trust between the two countries. North Korea did not indicate it wanted to completely upend dialogue and potential future negotiations with Mr. Trump. Top official Kim Yong Chol gave a letter to Pompeo from Kim Jong Un and the North Koreans said they wanted to build on the "friendly relationship and trust." After the Singapore summit, Mr. Trump had described a "special bond" with Kim. "We still cherish our good faith in President Trump," their statement wrote. Pompeo did not meet with Kim Jong Un while he was in North Korea, the first time he has visited the country and not done so. Ahead of the trip, White House press secretary Sarah Sanders said he was planning to meet with the 35-year old dictator, even though Pompeo said that was never the expectation. There are still questions about why the U.S. has replaced the descriptors "complete, irreversible and verifiable" for North Korea's denuclearization process with "complete denuclearization." On Sunday, South Korean Foreign Minister Kang Kyung-wha admitted that replacing the former term was capitulating to North Korea's sensitivities. She noted that there is a "historical context" which has made it "somewhat difficult" for North Korea to sign off to on the term "complete, irreversible, verifiable." Pompeo, however, bluntly said there is "no difference" between the extensive descriptor and the simplified version. He has pushed back on questions about this change in the past and berated reporters for asking about it, but said in Tokyo that North Korea has already acknowledged that they will have to allow inspectors to verify denuclearization efforts. "We had lengthy discussions about the scope of what complete denuclearization means over the past two days," Pompeo said. "My two colleagues have said, from weapons systems to fissile material to the production facilities, enrichment facilities, across the range of weapons and missiles -- it's a broad definition of denuclearization. The North Koreans understand that and have not challenged that ... They also understand that denuclearization makes no sense absent verification."